Editor’s Note: Embracing the UWC mission and values is a life changing and far-reaching experience, we like to say. This is specifically true for our current Alumni-in-Residence participant Cadence. Since mid-January, Cadence Matthews, daughter of alumnus Chris Matthews (YR 7/1982, Canada-ON), has become a beloved and well-respected campus resident as part of the “A-I-R” program. Despite not being an alum herself, Cadence has always had close connections to Pearson and the UWC mission, being inspired by her father. 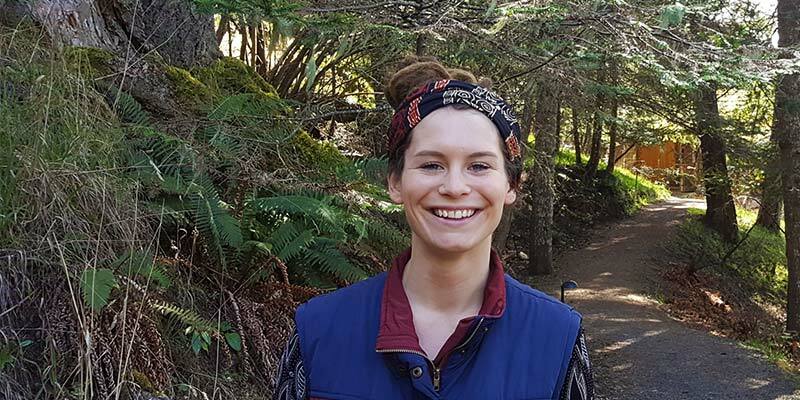 Cadence recently graduated from ACTS Seminary accredited through Trinity Western University and is currently working on her thesis in using “religion and spirituality as a force to unite people, nations, and cultures for peace and sustainable future”. As part of her research, Cadence reached out to her father’s alma mater, inquiring if she could offer her services as Campus Chaplain. Even though she has been on campus for only a short while, she seems to have always been part of campus life as she is passionate about community, connection, and talking about faith and spirituality in all forms. In her work as part of the health and wellness team, she offers emotional and spiritual support to the community and creates a space for deep respect and support for religious diversity. At Pearson, I am currently serving at in the role of campus chaplain, a position that I have been developing and implementing for the past several months. I offer emotional and spiritual care by creating space for students to be heard, seen, and valued. I guide students in identifying and affirming their beliefs, ideals, and faith, both in times of need and throughout day-to-day experiences. In expressing and embracing their truth, I firmly believe that our students begin to truly understand the value each individual inherently possesses, a value that rests on the foundation of our shared humanity. My goal has been to foster relationships between all cultures, religions, communities and creeds in order to reach the goal of building peace. I offer care that is congruent with one’s faith life, tradition, background and culture. The greatest need I see in the student wellness environment is to create space for vulnerability. The intellectual and highly academic culture of UWC fosters countless positive character traits in our students, such as creative thinking, ambition, and critical analysis, along with preparing them intellectually for future education and leadership opportunities. Unfortunately, some of the by-products of this culture are unintentional, yet can foster realities of stoicism, facades and emotional suppression. The solution is not immediate, and these will not change without a very intentional and counter-cultural effort. The most important step towards holistic student wellness is found in a truth that I firmly believe: To embrace vulnerability is our greatest measure of courage. I strongly believe that pain that is not transformed does not simply disappear. Brene Brown put it this way, “our compacity for wholeheartedness can never be greater than our willingness to be broken.” To know joy is to know pain, that is why pain must find a voice. Within my role I do not have an agenda, but I simply create space for difficult conversations, connection, and vulnerability. Another need that I feel like I have been able to step in is addressing the division and tension among students that are from areas of conflict that is largely to do with religious issues. I facilitate a group called “Life Chats” which is an interfaith group that meets once a week. I have been able to facilitate difficult conversations between students that come from countries of conflict. Through these discussions I have been able to lead the students to a deeper understanding of their shared humanity and to discuss the possibility of social change. Within this group we share sacred music, religious traditions, find shared values, emphasize fairness to every viewpoint, read from different holy texts, share personal experiences and all grow through a personal search for truth and justice. Within, the role of creating space, one thing that comes up a lot is spiritual distress. Spiritual distress is the void that sets in when everything you’ve always believed is no longer comforting you in your present situation. I create space for fear and hope to live together. I create space as students ask immensely difficult questions. Questions about yesterday, about today, and about tomorrow. Questions about the problems in our world that require creative and radical solutions, and questions about the little things that may seem insignificant from the outside looking in, but to the individual young person asking such a question. The way we as mentors and educators guide them to an answer may have profound effects on their future. Further, one of the biggest components to my role is being a purposeful listener. For those that are unfamiliar, purposeful listening takes a willingness to be open to the myriad variations of human responses to loss and to be prepared to respond to the unexpected and unscripted situations that arise. Listening is not just about hearing words, but also feelings. It is listening for what is said, and what is left unsaid. Listening also involves a certain amount of sensitivity to what is happening, to who is making it happen, and what is meaningful to them. In creating space for meaningful conversations, I hope to shift the culture in whatever way is needed to optimize health, encourage vulnerability, and further the development of each young person’s character. Within, my role my goal is always to make tangible steps towards peace among the various religions, cultures and worldviews of our incredibly diverse students. Through connection, openness, and vulnerable conversation, these young people can more deeply embrace peace and unity. It is my greatest hope that this embrace of peace and unity would have a ripple effect throughout our world, and in our individual communities.